Players from the top of the AITA tennis ranking will be competing together with newcomers and upcoming talent. Tennis of the highest class will on display right here in the valley. This is a fantastic push for tennis in India as the tournament will be an all India event with players from all regions participating for the grand prize. With a total prize money of Rs. 50,000, this tournament is truly lucrative for the big boys in tennis. In line with the Ravine tradition, the tennis club players and indeed the onlookers can definitely expect some start glamour, maybe some celebrity chief guests?! Well, keep your fingers crossed because you never know. 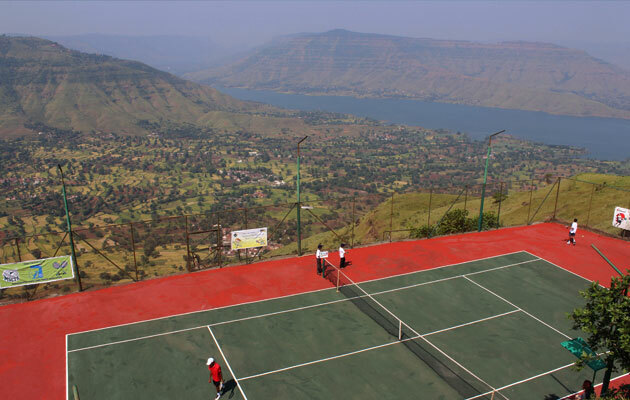 Where else will you get such a tennis playing location with green valleys overlooking the waters of the Dhom Dam and 4 International Class tennis courts with each one having its own unique view to admire. Where else can you practice other than the tennis court adjoining the valley where strong winds play against you and teach you to adjust with the bounce that equals the kookaburra bounce at the Wanderers in Johannesburg. It is definitely not just the tennis or the prize money, but also the locations that will get you in the competitive mood right from the word go. With such a competitive event taking place on the Ravine grounds, we couldn’t help but make the occasion even sweeter for you. Here’s more of what we have in store for you. All tennis player hotel room bookings can enjoy a 15 percent discount on the room tariff. We give a waiver on the gym use costs to all tennis players here for the tournament so feel free to use the gym facilities while you are here. We extend a spa treat for the players and their families by offering them a 15 percent discount on any spa treatments on spending Rs. 1000 or more at the in-house Serenity Spa. We welcome you to come and watch the next tennis tournament at the Ravine Hotel or participate yourself and improve your AITA tennis ranking. We welcome you to come an experience a slice of tennis in India and enjoy competitive tennis in the truly scenic Panchgani valley. Take this tennis event as an invitation to visit Panchgani and experience the closeness to nature. Come play, watch or just sit back and enjoy for the Ravine Hotel is just the right place to unwind.